sense of community, which is why it is important that it always has small class sizes to ensure all clients get hands on corrections, connect with the instructor, and most importantly learn how to work in proper form. Known for its innovative and body-redefining method, ChaiseFitness was designed and founded by mother-daughter duo Lauren Piskin, a former gold medalist figure skater, and Rachel Piskin, a former ballerina with the New York City Ballet. Their energy and decades of professional experience is the driving force behind the unique hybrid workouts at ChaiseFitness, which blends the sculpting and strengthening methods of Pilates, ballet, cardio and strength training. As a long-time professional Pilates instructor, Lauren always wanted to “get Pilates off of its back and bring it into the modern upbeat vibe of New York City,” but it wasn’t until Rachel’s ballet career came to an end that she started developing a way to make that happen. Rachel was struggling to maintain the healthy lifestyle she always had from dance, so she and Lauren began to experiment and create a new type of workout that eventually gave her an even stronger and healthier physique. 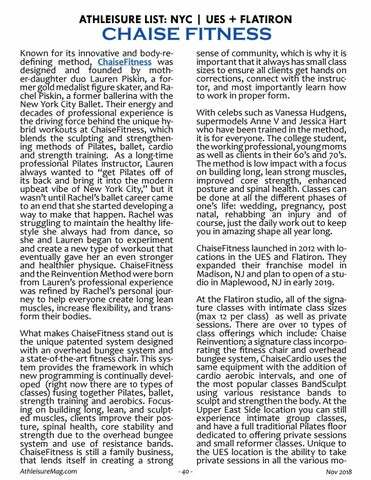 ChaiseFitness and the Reinvention Method were born from Lauren’s professional experience was refined by Rachel’s personal journey to help everyone create long lean muscles, increase flexibility, and transform their bodies.